Crissy Field Dog Group is a 501(c)(3) non-profit organization dedicated to promoting and advocating for responsible dog ownership and establishing and upholding permanent off-leash dog walking rights within the Golden Gate National Recreation Area (GGNRA). CFDG is working directly with the GGNRA, our Congressional delegation, and other stakeholders to advocate off-leash dog walking and other recreation issues within the GGNRA. These areas include Crissy Field and other GGNRA lands in Marin, San Francisco, and San Mateo counties. It is our ultimate goal to restore permanent off-leash dog walking and preserve recreation as an important resource value within the GGNRA. As an organized non-profit group, we have a substantial membership base and voice in the San Francisco Bay Area. Earlier today, CFDG sent a letter to the GGNRA’s Superintendent Laura Joss, requesting that an addendum be put in place to formally finalize the GGNRA’s Dog Managment Plan and Rulemaking process. We believe that this addendum is necessary to complete the administrative process announced in NPS’ December 2017 Notice of the Federal Register, indicating that NPS had terminated the Dog Managment Planning process. It is unclear how NPS/GGNRA will respond but we believe very strongly that we need to have this place so we can have complete closure on this issue. Please share this video with friends, family members and your other dogggie friends…we want to keep the GGNRA areas off leash and a safe place for ALL visitors! Today, a Notice in the Federal Register stated that the GGNRA’s Dog Managment Rule and Plan has been formally withdrawn. Also, the Marin IJ wrote an article today about this new development. Yesterday, CFDG sent a letter to the National Park Service requesting that they formally withdraw from the Dog Managment Proposed Rule AND that any language in the GGNRA’s General Managment Plan be “excised” so as that NPS can not come back and try to sneak in a Dog Management Plan or Rule unilaterally. The other news is that NPS announced that Laura Joss will be the new GGNRA Superintendent. We hope that Ms. Joss will be community oriented and work well with all stakeholders…she has a big job ahead of her as to regain the public’s trust with GGNRA visitors, communities and neighborhoods. Fantastic news today! In their press release today, NPS announced that it has permanently ended a planning and rulemaking process for the GGNRA’s Dog Mgt Plan and Rule. While this is fantastic news, the NPS has still not signed the Record of Decision for this Rule yet. We will be pursuing this issue immediately. CFDG has been working for the past 17 years on this issue and we want to thank all of our long standing supporters! WASHINGTON – Today, the National Park Service (NPS) announced it has permanently ended a planning and rulemaking process intended to establish new regulations related to dog management at Golden Gate National Recreation Area (GGNRA) in California. The decision follows the completion of an independent review of the dog rule planning and rulemaking process. GGNRA will continue to enforce existing pet regulations detailed in a 1979 pet policy and the Superintendent’s Compendium. The current regulations allow visitors to walk managed dogs under voice or leash control in specific areas of the park. The nationwide National Park Service regulation requiring dogs to be on-leash will apply to areas not covered by the 1979 policy. The NPS has also adopted two special regulations that modify the 1979 policy for parts of Crissy Field and Ocean Beach. For the time being, the interim permit requirement for commercial dog walkers will remain in effect. Washington, DC – Congresswoman Jackie Speier (D-San Francisco/San Mateo) released the following statement today after her amendment to prevent the National Park Service from restricting off-leash dog walking in Golden Gate National Recreation Area (GGNRA) near San Francisco passed the House of Representatives. We will keep you posted about any further developments. CFDG does NOT support or endorse leaving dog poop at Crissy Field as means of protest today or tomorrow. CFDG has a long history of being a good canine citizen as we have cleaned up dog waste at Crissy Field for over 15 years as our volunteers regularly fill the doggie dispensers with poop bags that we provide. While we respect everyone’s choice for their freedom of expression, there are many other constructive ways to protest. We do know that the Patriot Prayer Rally is from 2-5pm at the West Bluff Bluff Picnic Area. And the only entrance to Crissy Field will be at Marina Blvd. This will be a check point and law enforcement staff will check your personal belongings. We’ll keep everyone updated as soon as we know more information as to when law enforcement will be closing off Crissy Field and the Presidio with these conditions. Please share this information with your doggie buddies, family and friends. The GGNRA just released their statement (below), allowing for the Approval of First Amendment Event Applications at Crissy Field. We urge those planning to attend these events to share their views in a peaceful manner, to look out for each other, and to support law enforcement personnel to keep everyone safe. NPS respects the right to free speech, and in turn, we expect all participants to respect one another and this beautiful national park. National Park Service law enforcement personnel from around the country are working together with the San Francisco Police Department to ensure safe events for all participants. In particular, NPS law enforcement personnel are working very closely with the SFPD on the Patriot Prayer First Amendment event. Any violence will not be tolerated. We welcome all to express their views by writing us at goga_1st_amendment@nps.gov or calling: 415-561-2822. “Off-leash dog walking has been allowed in the GGNRA for 40 years and it’s a cherished activity for dog owners and dog walkers. I’ve said for years that a dog management plan without any off-leash areas in San Mateo County is unacceptable. Furthermore, the more recent revelations of the use of personal emails by National Park Service staff to influence the rulemaking process are deeply troubling. NPS employees appeared to show bias and acted improperly in advising the anti-dog walking side of this issue”. Congresswoman Jackie Speier issued a statement and CFDG’s Martha Walters was interviewed for this piece. The Marin IJ released a story today about the NPS Review Panel and the GGNRA’s Mgt. Plan and Rule. CFDG sent a letter today to Secretary Ryan Zinke, who is the head of the Department of Interior. This letter focuses on our deep concerns regarding the scope and composition of NPS’ Review Panel and requests for some specific actions. The National Park Service takes our mandate to provide safe access to our parks to all visitors seriously. The National Park Service recognizes well-managed dog walking as a healthy and popular way to enjoy parklands. Following the release of the Final Environmental Impact Statement on the Dog Management Plan at the Golden Gate National Recreation Area in December 2016, we learned that a former employee used a personal email account to communicate with outside parties, and did not forward those communications to a government e-mail account. Since that time, I have commissioned an independent review panel of three government officials from non-NPS federal agencies with expertise in environmental planning, rulemaking and National Environmental Policy Act procedures to review this use of personal email. I have requested they evaluate and report on how these emails may have impacted the planning, rulemaking process, and environmental impact study, and make recommendations on how best to proceed given the significant body of work to date – including thousands of comments and more than a decade of analysis. 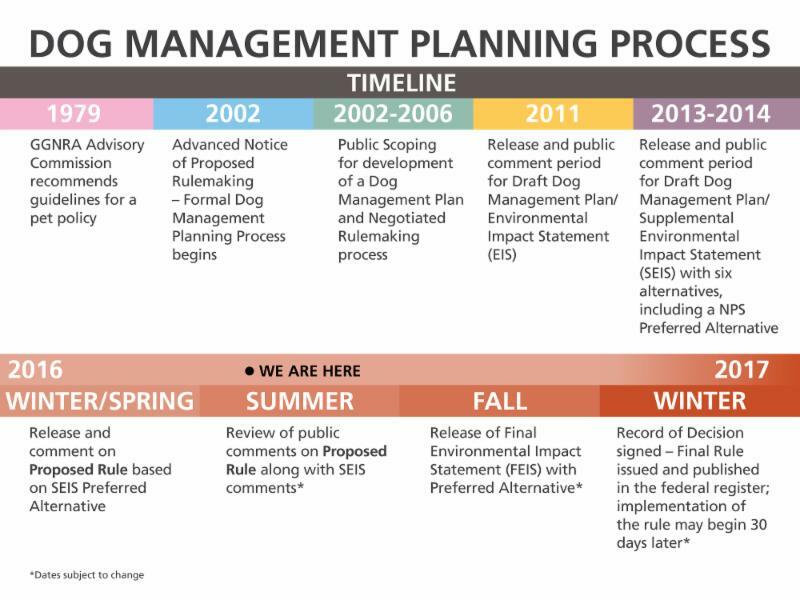 I have given the review panel access to all records and information associated with the planning, rulemaking and environmental review conducted on the Dog Management Plan and asked that the panel deliver a report to me this summer. We intend to determine the National Park Service’s next steps related to dog management at GGNRA following the completion of the report, and we will report the results of the internal review to the public. Our goal is to restore trust in the process and proceed with transparency around this critical issue for the park and the community. Following more than ten years of public engagement, including more than 4,100 comments, and investment in a process intended to balance the needs of all park users, the findings of this independent review team will help us determine the best path forward to meet the needs of all park visitors at Golden Gate NRA. SAN FRANCISCO— The first phase (Phase A) of a $5 million repair project to the Crissy Field Promenade is nearing completion. Construction crews will begin to lay the new and improved trail surface on the eastern end of the promenade (Phase A) later this week and expect to reopen this popular trail section adjacent to East Beach by late May. Beginning next week, construction set-up and some closures will begin on the central section of the promenade (Phases B and C). Work on Phases B and C will now be combined to enhance public safety and expedite project time frames. The central promenade work is scheduled for completion by the end of June. Park rangers ask all visitors and recreationalists to stay alert, follow detours and remain flexible to changing conditions as work progresses in the coming weeks. Detour signs as well as project information coordinators from the Golden Gate National Parks Conservancy will continue to be on-site during work hours to help visitors navigate dynamic detour routes and beach access points. During Phases B and C, cyclists and pedestrians will be rerouted off the promenade to the nearby Mason Street multi-use path. The beaches, marsh and airfield, as well as nearby Presidio destinations will remain open throughout construction. The park had hoped to keep part of the promenade open for public use through Phase C while doing work on Phase B, but determined it would not be safe due to heavy trucks and construction equipment traveling through the central section of the promenade. Combining work will also allow crews to complete work on the central section of the promenade more quickly, shaving a predicted 15 to 30 days off the length of the project. Harsh weather and high use have caused the promenade surface to degrade beyond simple repair. The project will completely remove the old decomposed granite and replace it with a more durable compacted shale material that is expected to perform better over time. The promenade repair remains on schedule and expected to be complete by the end of the summer. For more information, FAQs, and maps, visit the project website at go.nps.gov/crissypromenade or find them on Flickr. The GGNRA is resurfacing the promenade at Crissy Field for the next month or so. Currently, Phase A is underway adjacent to the East Beach parking area. We strongly encourage Professional Dog Walkers NOT to park or use the access area here until this phase of work is completed. CFDG wants safe access for all visitors at Crissy Field during this construction period. Here are a grouping of emails that the GGNRA recently released on their FOIA website. These emails reveal that former GGNRA Superintendent Chris Lehnertz and Howard Levitt, former GGNRA Director of Communications and Partnerships, used their private email accounts for GGNRA-related matters on dog management planning, and in so doing, worked with people including Amy Meyer, Neal Desai, and Rebecca Evans, who have been vocal in their support of the GGNRA’s “preferred alternative” that would seriously restrict dog recreation on GGNRA lands. In addition, the emails appear to show Lehnertz and Levitt helping to prepare Amy Meyer and others for their meeting with staff from Democratic Leader Pelosi’s office in 2015. Just as troubling are statements from GGNRA staff biologist Bill Merkel, Ph.D., who in an internal email during the EIS process acknowledges that GGNRA lacked “good baseline information on most resources in relation to current low levels of dog management.” This is important as CFDG has been highlighting the lack of site-specific, peer-reviewed, or other adequate baseline studies since the environmental review process started in 2009. Without adequate baseline information, a meaningful assessment of actual impacts in the EIS is undermined at a foundational level. All of these emails again illustrate the internal bias and unwillingness of certain GGNRA staff to conduct a proper EIS in compliance with NEPA (the core federal environmental review law for land use changes of this type), and to aid the opposing forces that support a restrictive dog management plan. CFDG continues to believe a thorough and independent review of the propriety of the GGNRA’s actions is required before any other determinations can be made on this process. The emails described here, and previously produced by the GGNRA, demonstrate that the planning process and public comment were fatally undermined and are legally insufficient, due to fundamental bias against dog recreation and improper communications by GGNRA staff. SAN FRANCISCO—Say goodbye to potholes and puddles! Loved by more than 18 million visitors since it opened in 2001, the multi-use Crissy Field Promenade is about to get some much needed TLC. Construction is expected to begin mid-March and last through the summer. Work will occur in four phases to minimize impacts to visitors, but each phase will require detours. Also there will be on-going storm drain repair during this time. Harsh weather and high use have caused the promenade surface to degrade beyond simple repair. The project will completely remove the old decomposed granite and replace it with a more durable compacted shale material. The new trail will look and feel similar to the existing surface but is expected to perform better over time. This means a smoother, drier run, stroll or bike for years to come! Detour signs as well as project information coordinators will direct park visitors around the construction zone. The beaches, marsh and airfield, as well as nearby Presidio destinations will remain open. The Mason Street bicycle and pedestrian path is the recommended route for all bicyclists traveling along the Bay Trail. For more information, FAQs, and maps visit the project website at go.nps.gov/crissypromenade or find them on Flickr. The Crissy Field Dog Group is proud to be partnering with the Bow Wow Film Fest! A fun, family event that supports local dog rescues. The San Francisco event will be held at the amazing SOMArts Center Theatre! Doors open at 6 and the movies start at 7! Tickets are $20 for adults and $10 for kiddos 12 and under. At the door tickets will be $25 for adults and $10 for 12 and under. Come on out for a fun evening! Watch some awesome flicks and win great schwag while supporting valuable animal rescue organizations! On January 20, 2017, President Trump signed an executive order to freeze regulations in the federal government. This means that the GGNRA’s Dog Management Plan/Rule can not be promulgated for at least 60 or more days. CFDG will continue to track and monitor this process. The recent winter storms have left a lot of debris at Central Beach including large pieces of wood, plastic, glass bottles, etc. It would be helpful when you walk your dog at Crissy Field to bring extra bags from home to help clean it up and encourage other visitors to help too! This afternoon, Rep. Jackie Speier sent a letter to the Dept. of Interior’s Inspector General’s office requesting an independent inquiry into “improper activity” of a former GGNRA employee during the federal environmental review process for dog management in the GGNRA. CFDG fully supports Rep. Speier’s request for a truly independent inquiry. Today, the GGNRA put the Dog Management Plan and Rule on “Hold” for the near future. While this is very welcomed news, CFDG will continue to work on this issue, to examine the results of the “independent review” and the path forward with the GGNRA. SAN FRANCISCO – The National Park Service is putting on hold the signing of the Record of Decision and the publication of the Final Rule for Dog Management at Golden Gate National Recreation Area. The decision comes in response to requests from members of Congress to extend the waiting period for the Final Environmental Impact Statement. This pause will also allow the National Park Service to conduct a review of certain records being released in response to an ongoing Freedom of Information Act (FOIA) request related to the park’s Dog Management plan and rule. To date, the National Park Service has released more than 260,000 pages of documents dating as far back as 1999 in response to the FOIA request. As part of its ongoing release of records under FOIA, in late-December 2016, the Park Service learned that a former park employee had used personal email for official communications related to the Dog Management Plan planning process. Upon learning this, the Park Service contacted the former employee and obtained his cooperation to conduct a search of his personal email accounts for agency records related to the Dog Management Plan planning process. As a result of that search, the Park Service recovered approximately 137 pages of emails that were responsive to the FOIA request. Those FOIA records will be released and posted today at https://www.nps.gov/goga/learn/management/dog-management-records.htm, “Records Released January, 2017”. The Park Service will conduct an independent inquiry into whether personal email was used in a manner that is not consistent with applicable laws and policies, and if so, whether its use affected the planning and rulemaking processes. The Park Service will report the results of the internal review to the public. To help ensure an independent and impartial review, the inquiry will be conducted by National Park Service personnel who were not involved in the dog management planning process. Further action under the National Environmental Policy Act and the rulemaking process for the Dog Management Plan will await the findings and conclusions of the independent review. As of this moment, we still have not heard if the GGNRA will grant the 30 day extension to their comment period. Congresswoman Nancy Pelosi (SF), Congresswoman Jackie Speier (San Mateo/SF) and Congressman Jared Huffman (Marin) all sent letters to the GGNRA and the Department of Interior recently requesting a 30 day extension to their comment period. We want to thank them all for understanding our deep concerns about the current Dog Management Plan. Crissy Field: East Beach is still no dogs and NPS added just a little more land for the grassy airfield. And other areas in SF, Marin and San Mateo did not see many changes either. Our legal team and board continue to work different angles right now. We are deeply concerned that NPS has not listened and incorporated our significant concerns. Below is the communication we just received from the GGNRA regarding the release of the Final Environmental Impact Statement (FEIS). We are trying to find out the exact timing of the release of this very important document. We will keep you posted when we have an update. The National Park Service expects to enter the final planning stages in the development of a Dog Management Plan and Final Rule for Golden Gate National Recreation Area (GGNRA) in the coming months. A Final Environmental Impact Statement (FEIS) is anticipated to be released this winter; the FEIS will analyze alternative approaches to dog management and recommend a Preferred Alternative. The Final Rule for dog management will go into effect following a period of public outreach, education and the installation of signage. GGNRA recognizes well-managed dog walking is a healthy and popular way to enjoy park lands. You can see a history and timeline of the dog management planning process here. The dog rinse station at Crissy Field’s East Beach will be re-opened tomorrow, Thursday July 21st. Martha Walters, CFDG’s Chair, has been working with the GGNRA to get both the dog rinse station and board sailors’ rinse station re-opened for our user groups. And as we discussed with the GGNRA, we encourage each and everyone of you to be mindful of using the rinse station and minimize how much water you use to clean your doggies. The other news is that Chris Lehnertz, GGNRA’s Superintendent, is being reassigned to Grand Canyon National Park. For those folks who haven’t been following the sexual harassment issues in the National Park Service, we have a link below to NPS Travelers who provides a good summary of what has happened over the past several months. We do not know at this time whom will replace Chris in her position. She is leaving the GGNRA in August. Below is the link to Congresswoman Speier’s Facebook page which describes the amendment to defund the GGNRA Dog Management Plan/Rule. Be sure to “like” her and/or say thank you…she has been a real champion for this cause! As of yesterday, this Interior Bill (5538) passed in the House but since Congress is now in recess, the Senate will vote on the Bill in September. And as we mentioned earlier, in all likelihood, the Senate will pass this Bill but it is highly unlikely that the President will sign the Bill due to a number of controversial issues in it. It does send a very clear message to NPS and Interior that Congress is very unhappy about what they are doing out here on this issue in the San Francisco Bay Area. YAY! Congresswoman Speier’s amendment to not fund the GGNRA’s Proposed Rule for Dog Management PASSED tonight as part of HR 5538. The fate of this amendment rests with the passage of this Bill. The amendment passed entirely unopposed. However, this bipartisan amendment sends a clear message to NPS and Interior to take our concerns and public comments seriously. We will keep everyone posted as to how this amendment process plays out. Please let Congresswoman Speier know how much you appreciate her efforts. Go to speier.house.gov and THANK her! Congresswoman Jackie Speier submitted an amendment to H.R. 5538 (U. S. Interior Bill) which states that “None of the funds made available by this Act may be used to facilitate, implement, administer or enforce” the GGNRA’s Proposed Rule, “published in the Federal Register on February 24, 2016″. We do not know when this Bill will be voted on and will keep this website updated. Please thank her for her continued efforts in supporting us to retain dog walking recreation in the GGNRA! Go to speier.house.gov and THANK her! The GGNRA released the following information today about the timeline associated with their Dog Management process. And again, we believe that NPS/GGNRA will need to issue a revised or another draft rule to address CFDG’s serious concerns that we have articulated in our letters to them regarding the serious flaws in their Proposed Rule. Also, we want to share a Washington Post article about the “unethical behavior” reprimand regarding NPS Director Jarvis. The 90 day public comment period on the Proposed Rule for Dog Management in Golden Gate National Recreation Area (GGNRA) closed on May 25, 2016 with over 4,100 comments submitted. Over the summer, we will be reviewing comments received both on the Proposed Rule and theSupplemental Environmental Impact Statement(SEIS). These comments can be viewed on our website. In the fall, a Final Environmental Impact Statement (FEIS) will be released which will include responses to comments on the SEIS and describe the preferred alternative. We anticipate a Record of Decision and Final Rule (with responses to comments on the Proposed Rule) in the winter of 2016-2017. GGNRA will then begin public education and implementation of the rule. Thank you to those who submitted comments on the Proposed Rule. We appreciate your participation in the process. You can expect periodic updates over the next several months. For more information on dog management planning, please visit our website. To request alternate formats of this email, or general accessibility information, please visit our park accessibility website, email goga_accessibility@nps.gov or call (415) 561-4958. Individuals who are deaf, hard-of-hearing, deaf/blind or have speech disabilities may utilize the Federal Relay Service number (800) 877-8339. You are receiving this email because you have expressed an interest in receiving updates from Golden Gate National Recreation Area. Don’t forget to add goga_planning@nps.gov to your address book so we’ll be sure to land in your inbox! If you’d like to unsubscribe please click the “SafeUnsubscribe” link at the bottom of this email. CFDG submitted our second and final letter to the GGNRA. We hope the NPS takes our letters seriously. Based upon the very flawed NPS Proposed Rule for Dog Management, we recommend that NPS “reconcile” these serious flaws and release a “Revised Rule” with a minimum of a 90 day public comment period which reflects a peer reviewed science based Rule so we can continue to co-exist with the other users of the GGNRA. Last chance to get your comments letters in…the deadline is this Wednesday, May 25th…8:59pm our time! Below is the link to comment on-line the GGNRA’s Proposed Rule for Dog Management. Be sure to include the RIN-1024-AE16 number on your letter and envelope. The end of the public comment period is May 25th! Here is CFDG’s sample talking points that you can use for your letter. Be sure to include the RIN-1024-AE16 number on your letter and envelope. CFDG just submitted our letter (from our attorneys K and L Gates), with input from Martha Walters and Gary Fergus, to the GGNRA regarding the Proposed Rule for Dog Management in the GGNRA. We will be submitting another letter next week too. Be sure to submit YOUR letter by May 25th!! The Marin Humane Society submitted their comment letter yesterday and here is the link to the letter: It is a fabulous letter! Why your voice and letters MATTER! In mid March, the GGNRA announced a fast-tracked project to reconfigure the East Beach parking lot and resurface the promenade with composite shale and repair storm drainage at Crissy Field as part of the National Park Service’s Centennial event. We attended a “field event” at Crissy Field, and after reading and reviewing the proposal, we discovered that it would result in some unwanted changes (see below). While they denied our request to extend the two-week comment period, we submitted substantive arguments why the parking lot changes should be allowed ample time for broader public comment. Our board agreed with proposed plans to repair storm drainage on the path and resurface the promenade with composite shale. - Remove the staging area used by the board sailors, leaving them no safe place to put together their equipment. CFDG Board member Gary Fergus and CFDG Chair Martha Walters met with GGNRA staff to discuss these concerns. CFDG also partnered with the SF Boardsailors to articulate our serious concerns about the proposal and the speed in which the GGNRA wanted to move this project without proper public comment and input. Attached is the letter and map (Gary created!) that CFDG submitted and the SF Board sailors’ letter. Over 100 people submitted written comments articulating their concerns to the GGNRA about this issue. Also attached is the GGNRA’s reply memorandum that only allows for the resurfacing of the promenade and work they need to do on storm drainage issues at Crissy Field and no reconfiguration of the East Beach parking lot at this time. As a result of our meeting and protest, the GGNRA agreed to go through a more detailed land use process to assess and develop an acceptable plan in the parking lot. This process will allow the public to participate in deciding what will happen in the East Beach parking lot, so stay tuned. Here is CFDG’s video for the GGNRA’s Proposed Rule…feel free to contact us if you have any questions! Below is the link to comment on the GGNRA’s Proposed Rule for Dog Management. Be sure to include the RIN-1024-AE16 number on your letter and envelope. The end of the public comment period is May 25th! We wanted to let you know that the Mighty Mutt March today was a huge success…we estimated that around 1000-1500 folks marched, listened to speakers like SF Supervisor Scott Wiener and SF SPCA Co-President Jennifer Scarlett, enjoyed the yummy food from the two food trucks, danced to the fun live music and all of the doggies enjoyed it too! It was a peaceful and fun event. Also, CFDG wants to thank all of the other dog groups who all worked collaboratively on this March, especially the event organizers, Andrea Buffa and Dave Emanuel from Save Our Recreation! Everyone pitched in and the doggie bandana’s were a BIG hit. Below is the link to the Marin IJ Forum broadcast/video with Martha Walters, CFDG Chair and Barbara Saltzman, President, Marin Audubon Society. Save Our Recreation files a lawsuit against the GGNRA about FOIA issues: go to News Top Stories for more details. CFDG will be hosting two public comment workshops about how to best write your comments regarding the GGNRA’s Proposed rule with Ash Miller, our attorney, and Gary Fergus CFDG Board member. Here is the link for CFDG’s Flyer for these two workshops CFDG_flyer. Please pass these around far and wide! Tuesday April 12th from 6:30 to 8:30pm at the San Francisco SPCA, 201 Alabama Street. Wake up! The GGNRA wants to close many areas like Crissy Field, Baker Beach, Marin Headlands, Muir Beach, Sweeney Ridge and Rancho Corral de Terra to dog walking…Below is CFDG’s video on the proposed rule making and how you can write and submit comments. Get involved…Take action! Go to our News/Top Stories page for a recap of the Proposed Rule at Crissy Field and other areas within the GGNRA that will be affected if the Rule gets finalized…thanks to Save off Leash for some of the content! The GGNRA released the Proposed Rule for Dog Management today and it’s looking pretty grim for off leash spaces in the proposed rule. Here is the link to the rule…www.regulations.gov. You can read and comment on the Proposed Rule there. And here is the link to the maps Proposed Rule for Dog Management in the GGNRA. As far as Crissy Field goes, only the central beach and part of the grassy airfield will be open for off leash. So, that means east and west beaches will be closed, the promenade, parking lots and another part of the grassy airfield. And the GGNRA has agreed to extend the public comment period to 90 days, instead of 60 days. We will post more information as we know it. CFDG will host a “How to write an effective public comment” session in San Francisco, probably in late March. Ash Miller, CFDG’s attorney will lead this important session. The Crissy Field Dog Group has created many videos about preserving off leash dog walking and recreation access at Crissy Field and other areas within GGNRA lands in Marin, SF, and San Mateo counties. You can go to You Tube and search “Crissy Field Dog Group” to view our catalogue of videos.